We laugh at the idea of the wine kiosks now. That was in the past, and it was crazy, but, we tell ourselves, it's over now, and even the PLCB gets it. That was just that crazy Joe "Da CEO" Conti and his effort to make the PLCB "modern" (and maybe pay off some political cronies). Except many of the people responsible for the wine kiosks, the bureaucrats, are still in place. Conti's gone, and PJ "PJ" Stapleton is gone, and James "Fall Guy" Short is gone (though still not sentenced...), but the faceless minions at 910 Capital Street are largely still there, still making some great decisions. Still, the wine kiosks were such a disaster, one that made Pennsylvania a national laughingstock, that it's worth having a full look at just how stupid it all was, and exactly how it happened. First, a summation from House Speaker Mike Turzai, from when the kiosks fell apart, back in September 2011. “I don’t think it comes as a shock to anyone outside the PLCB’s top echelon that the wine kiosk program was a complete failure. The kiosk program was a joke from the very beginning and the PLCB knew it. The agency’s own internal evaluation committee recommended against the kiosk idea. Yet the board went through with the cockamamie program anyway. How did it actually happen? How did we wind up with the Incredible Robot Wine Army? We've got it all, right here. March 28, 2008 – Public Notice of Wine Kiosk RFP on PLCB and DGS websites; proposals due May 8, 2008. Simple Brands (Simple) is the only applicant. July 9, 2008 – PLCB RFP Evaluation Committee submits report to PLCB Chief Counsel’s Office for inclusion in that day’s board meeting. Report advises against contracting with Simple, not a well-founded business plan; failure to get advisory opinion from TTB (federal government) on permissibility of Kiosk program; awards Simple a score of 305 out of 1,000 points for its proposal. July 9, 2008 – RFP Evaluation Committee advised that the board would not be reviewing the committee’s report; committee members told to destroy all copies/documentation relating to the report; and that CEO Joe Conti would meet with them on July 10. July 9, 2008 – LCB members met and voted to approve Simple Brands proposal. January 29, 2009 – Effective date for Contract 20080318 between LCB and Simple for 100 wine kiosk vending machines. June 30, 2009 – Relationship between Simple investors and former Governor Ed Rendell discovered: Investor Herbert Vederman gave Mr. Rendell $346,276, including a $100,000 lump sum in 2002, campaign finance records show. Mr. Vederman also served as the governor's campaign finance chairman. His business partner, Ira Lubert, meanwhile, gave Mr. Rendell $140,980 in that time period. June 23, 2010 – LCB places two kiosks in Harrisburg area grocery stores: Giant Foods in Dauphin County and Wegman’s in Cumberland County. June 30, 2010 – End of FY 09-10, Profit and Loss statement. Kiosk program showed a net loss of $255,077. 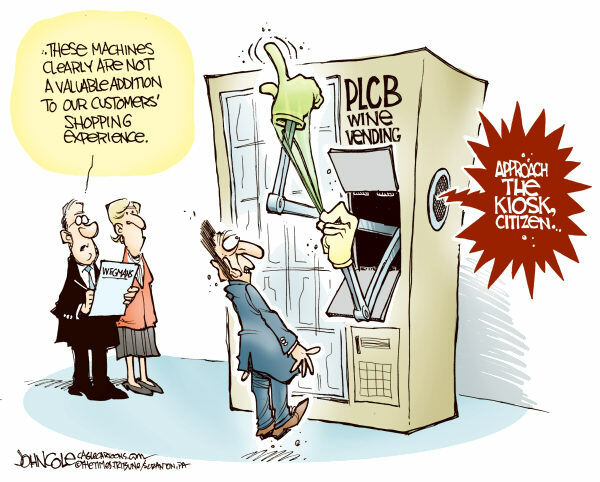 July 9, 2010 – LCB conditionally accepts delivery of two kiosk machines subject to Simple remedying operational problems with the machines (doors failing to open or close, credit card machine failures and general failures with particular transactions). September 1, 2010 – Second letter sent to Simple giving conditional acceptance of two kiosks provided they remedy operational problems within 60 days of notice. September 8, 2010 – Contract with Simple amended to include a $1 per transaction fee (collected from the consumer and paid to Simple) and a 50-cent per bottle “advertising fee.” The amount to be paid to Simple for advertising was capped at $1.5 million per year. PLCB also warned Simple that it would not accept delivery of additional kiosks (only two were in operation at the time) unless the various problems previously identified by the board were remedied. December 30, 2010 – PA Auditor General notifies the board of its Wine Kiosk performance audit and advises LCB to preserve and maintain any and all documents and materials (including e-mails) relating to the kiosk project. February 22, 2011 – Simple hopes to expand to smaller kiosks at convenience stores like Wawa and Sheetz – per letter to the Board. June 2010 – Wegman’s notifies LCB it will terminate its “kiosk” relationship. June 30, 2011 – End of FY 10-11, Profit and Loss statement. Kiosk program showed a net loss of $843,369 for FY-10-11; Additional losses (not accounted for on prior FY P&L statement) of $24,877. Total net loss for project: $1,123,323. August 4, 2011 – Response from LCB indicates Simple failed to obtain TTB advice and that no billing had been done up to that point, but LCB was in the process of sending the Profit and Loss statement to Simple for payment. August 5, 2011 – Board demands payment from Simple. August 15, 2011 – Walmart advises PLCB it will not participate in the Kiosk program (23 machines were planned for Walmart stores). August 17, 2011 – PLCB chief Joe Conti indicates the agency will continue the wine kiosks once its litigation is resolved. "This was not a faulty fiscal decision," Conti said. September 1, 2011 – PA Auditor General issues audit detailing the failed program. 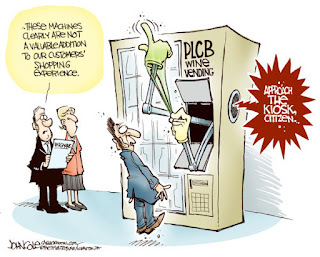 September 16, 2011 – PA Independent reporter Eric Boehm reports, contrary to public comments and direct testimony, PLCB failed to conduct any market research in relation to the kiosk program. September 20, 2011 – PLCB announces the end of the failed kiosk program; it pulls the plug on remaining machines in several supermarkets. January 25, 2015 – PLCB legal costs for the "free" kiosks have exceeded $300,000 pushing total losses to $1.5 million, not counting PLCB resources and personnel costs, which have never been accounted for. So here it is, five years later, and the PLCB insiders and their supporters have made sure that NOBODY has been held responsible, even though there are absolute violations of the PLCB Code of Conduct in that: "No member or employee of the Board shall: use for personal gain or for the gain of others any information obtained as a result of service or employment with the Board, and not available to the public at large." Having reports destroyed does not make things available to the public at large. Plain and simple. While the Board may have changed, the entire Directorship are people who were brought up in this system, ingrained with this way of doing things and tacitly approved the entire fiasco by not doing or saying anything. These are the people who are going to "modernize" the PLCB. Do we really need them to do that? Do we need them at all? The employees working in the stores at the time knew that this was a bad idea but,of course,were never asked for their thoughts or opinions regarding the implementation of such a kiosk program. Another waste of money that at least, in part, would have been better spent staffing the stores appropriately. Most of the employees at the majority of the stores are multi-tasking like crazy which does not have to be. A Manager should be engaged in management tasks and duties and not also having to perform cashier and clerk duties.An employee should not have to work alone during periods of store operation because of an archaic formula that decides how many employees or hours a particular store should have to operate with. Since a store manager has so much of his duties done for hm by Harrisburg it should leave plenty of time to do clerk duties since after all, that is what they are - glorified clerks.